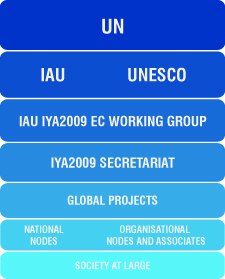 The IYA2009 is happening at all levels: international, national, regional and local. Most of the events are being organised locally and rely on local amateur and professional astronomers. However, an international network of interconnecting organising bodies ensures that the best ideas and practices are shared. Organising a small number of truly global events. Contact information for the organisers for press, educators and public. Lists of global and international events. Lists of events in each country. Links to the IYA2009 pages in each country. Ideas for local, regional and national events. The official IYA2009 Opening Ceremony took place at the UNESCO Headquarters, in Paris, on the 15th and 16th of January 2009. Another big IYA2009 event will happen on the occasion of the XXVII IAU General Assembly in Rio de Janeiro, Brazil, in August 2009. The official Closing Ceremony will most likely take place in Florence, Italy.